A Los Angeles high-school teacher's problems begin when he happens to witness a gangland killing and agrees to identify the murderers. Not realizing this will cause the underworld to retaliate "big time". 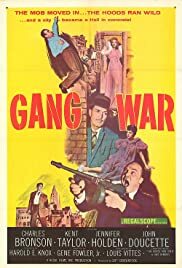 In 1872, Indian fighter Johnny MacKay is appointed peace commissioner for the California and Oregon territory but he faces tough opposition from the renegade Modocs led by their chief Captain Jack. A deputy marshal kills a murderer in a town that loved him, and when no one is willing to identify him, he can't collect any reward. Set during the Korean War, a unit of American soldiers, together with three British Tank Crew, find themselves trapped behind enemy lines. Alan Avery: Now say that someone did see a murder being committed. Police Sergeant Ernie Tucker: Say it was you. Alan Avery: But why me? Police Sergeant Ernie Tucker: We found your pills in that phone booth. Alan Avery: You've seen my wife. She doesn't belong on the firing line anywhere. And me? Well teachers just don't make great convincing heroes. Police Sergeant Ernie Tucker: They make good witnesses. What a bizarre little film! That's what I thought as did my guest, when we both watched this film recently on cable. There's a lot of originality going on from the minute the film begins, with Hollywood, California as the back drop, including the old Capitol Records building in the background. There were some interesting camera angles, as well as one unintentional humorous fight scene between some gangsters. As for the plot, well, it's "Death Wish" 1958 almost, with a young and raw Charles Bronson as a high school teacher. Gloria Henry, the mother from the Jay North sitcom "Dennis the Menace" plays his pregnant wife. Next time you come across it on cable, give the film a chance. You might end up watching it (and enjoying it), all the way through.